James Oddie's connection with the School of Mines (SMB) dates from his election to the School Council on 16 December 1873 at the Annual Meeting. Those present were Bickett (chair), Flude, Serjeant, Usher, Ford, Hudson and Williamson. According to the minutes of the Annual Meeting of Governors Rogers, Caselli, Chauncey, Davey, Lewis, McDowall, and Steinfeld were also elected to Council on 16 December 1873. The mining laboratory, housing two single-head stamp batteries, automatic drop roasting furnace, wheeler pans and chlorination barrel were installed. The laboratory catered for three shifts of eight hours for each 24 hours' day, working to capacity. He introduced the system of indentureship, whereby students could be indentured to members of staff for three years for a composition fee of 10 guineas. They received special tuition from the lecturer to whom they were attached. These indentureships ceased once diploma courses were established. Oddie met Henry Evans Baker in 1884 when Baker was building a telescope - a 12½ inch Newtonian reflector. 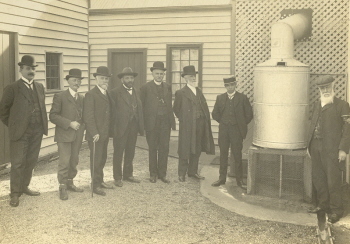 A three acre site at Mount Pleasant, Ballarat was surveyed for the purpose of an observatory and the building was commenced on 16 December 1885. James Oddie reportedly provided the funds for the new building and equipment and subsequently dedicated the buildings to the School of Mines. The formal opening of the observatory took place on 11 May 1886 and it was named the Oddie Observatory, a name which it retained until 1918. Oddie made a continuing and significant contribution to the Ballarat community as his public career testifies. He was elected to the first Ballarat Council which was formally constituted on 14 January 1856. He served as its Chairman 1856-59. Through a public meeting with James Stewart and Peter Lalor, he was instrumental in the establishment of many National schools in Ballarat. In 1867 he began the Old Identities Association (later known as the Old Colonists Association) and became its secretary. 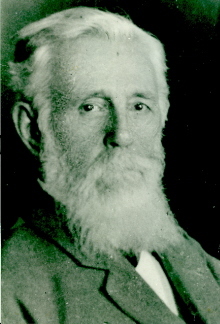 Oddie co-founded many institutions including the Ballarat Hospital, the Benevolent Asylum, Ballarat Female Refuge, Ballarat Mechanics' Institute, Art Gallery, Ballarat Town and City Mission, as well as the city's tram system. Oddie made many donations to SMB. He was instrumental in the acquisition of the Shackleton Polarizer, presenting it to the School of Mines in 1910. According to the photo mount Oddie was the inventor. Other donations include an x-ray tube used c1908, photos of New Zealand volcanoes (Burton Bros c1886), and numerous books on metallurgy. Born at Clitheroe, Lancashire, England on 31 March 1824 he emigrated on the Larpent in 1849 under Dr Lang's scheme. Oddie was amongst the earliest Ballarat pioneers arriving at the newly opened Ballarat Diggings in August 1851. He left Ballarat for Fryers' Creek (Castlemaine) and other gold fields returning to Geelong and then Ballarat district in 1853. Oddie set up a store on the diggings firstly at Smythesdale, then in Eureka Street not far from the Eureka Stockade. He then moved his store to corner of Dana and Armstrong Streets but around 1855 became an auctioneer. Oddie passed away on 3 March 1911.